"Dear James, I cannot thank you enough for the assistance you have given to Ronald and I and our friends during this difficult time. P.S. Jennifer is the Best!" 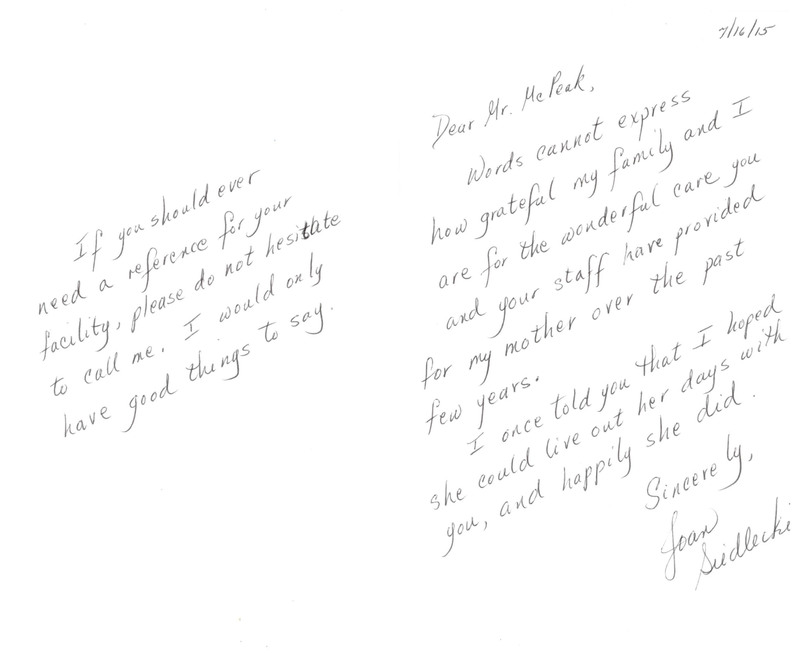 "Dear Mr. McPeak, My mother, Evelyn Castrataro, was cared for by your loving staff for the last years of her life. She lived to celebrate her 99th birthday with her nine-month-old great, great granddaughter. It was a comfort to me to know that she was safe in a clean, cheerful environment. The meals, activities, and assistance in daily hygiene produced a great change in her appearance and outlook. I will always be grateful for the staff's patience and willingness to coax her into accepting the help she needed. Thank you Mr. McPeak and Ms. Jennifer Turner. You do a wonderful job." "Dear Mr. McPeak, You went to see my Mom at South Oaks Hospital in 2013: saw the challenge and still took Mom into your home! How blessed we were that there was and is, a James McPeak. Your personnel is an extension of your high standards of dedication, compassion and professionalism as none of you gave up on Mom and just kept treating her with respect and dignity. She is now one 'happy camper'and at home, in your home! I would be too - puppy visit days, watching the oldies of Dean Martin and I Love Lucy, bingo and all the other activities and festivities you spend money for and always have going on to make them happy. You have a God-given gift thatyou were able to recognize and are using to make a difference in this world. Thank you for what you created and continue to carry on. Merry Christmas and a happy, healthy 2016." "Jennifer, I forgot to mention that my mother told me (again) how happy she is at McPeak's. I knew it would take her some time to feel comfortable. It's not an easy task, but I can hear the happiness in her voice. Please thank the staff for me. I am very grateful to everyone. :)"
"Dear Mr. McPeak, Barbara and I want to thank everyone for the outstanding care given to my mom Marie while in residence at what she called "the club". After her first stay in the winter of 2014/15 she often spoke fondly of that time, so we felt confident when she moved there last July that she would do very well. She enjoyed all the varied activities, good meals and all her new friends. We were so looking forward to her upcoming 100th birthday party, but alas, that wasn't to be. The hospice care she received in familiar surroundings was a comfort to her and to us in the last days. Thank you all again and God bless you." "Dear Mr. McPeak, On behalf of the family of Ed Weinmann, we want to thank you for making his day memorable, not only for him, but for our family and friends. I also would like to acknowledge your incredible staff. They are a great asset to your establishment. The kindness and empathy they exhibit is wonderful. Nothing is too much for them. They are extremely patient with your residents and I'm very grateful my uncle is part of the McPeak family." "Dear Mr. McPeak, Words cannot express how grateful my family and I are for the wonderful care you and your staff have provided for my mother over the past few years. I once told you that I hoped she could live out her days with you, and happily she did." "Dear Jennifer, The family of George and Ruth Thogersen would like at this time to express our sincere gratitude to the care of our parents while they were residents at McPeak's Adult Home. We appreciate the patience that you, Jim McPeak, and your staff offered both our family and our parents when both moved in the first time back in 2008. Initially, it was our Mom who was at the point that she needed assistance in most day to day activities - Dad at that point could have taken care of himself for the most part. Thank you for providing him free access to and from the building, and allowing him to squirrel away his little Merlot bottles and cookie treats for Mom." "Dear Mr. McPeak, I want to thank you for making a difficult day run smoothly for my uncle's transition into your home. I could see that your staff made him feel comfortable and have his best interests at heart. Your director, Jennifer Turner, was extremely professional and friendly and also made us feel at ease. I know he is going to be happy living in your home and I am very thankful there are people like you in this world making it a better place for our elderly relatives to live a more productive life." "Jennifer & James, I just wanted to express my families gratitude for your efforts and that of your staff on behalf of our mother Marie Thompson. Everyone at McPeak's demonstrated the most important quality as it relates to a family member being at your facility and that is compassion and caring of your residents. Our family visited the home on many occasions and always found that our mother was being well taken care of. We thank you from the bottom of our hearts that our mother lived out the remainder of her life in such a caring and secure environment. Please keep up the great work. We are sure you will." "Jim, Thank you for all the care that you gave my mother while she lived at McPeaks. Your home was her home. She always loved it when you spoke to her. It made her feel important.Your staff is exceptional. Everyone has so much compassion and love for all residents. The staffs families became her extended family. As my mother was declining everyone showed how much they loved her. Also, thank you for the flowers that you sent to the funeral home. I appreciate all that you did for my mother, Hazel, and for our family." "James, I wanted to thank you and the staff – Jennifer, Soraya, Myrna and all the girls for taking such good care of our mom. I wanted to stop in after I emptied her room but my emotions got the best of me when I closed the trunk on my car with all of her belongings inside. Thank you." "Dear Linda, My name is Danielle Cohen and my mom is a resident at McPeak's: Mary Huben. On a recent visit, I picked up a copy of the April newsletter and was delighted to read that my mom was mentioned because of her participating in musical activities. I cannot tell you how much that meant to me and my family. I just wanted to send you a note to say "thanks," but that doesn't even feel like enough! Please know how important the work you are doing is to us, the families, as well as the patients. It is of great comfort to know mom is in such good hands. As you know, she loves music, and always has. God bless you and your loved ones. You have a special place in my heart!" 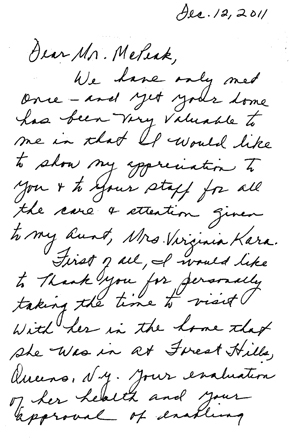 "Dear Mr. McPeak, We have only met once – and yet your home has been very valuable to me in that I would like to show my appreciation to you and to your staff for all the care and attention given to my aunt, Mrs. Virginia Kara. First of all, I would like to thank you for personally taking the time to visit with her in the home that she was at, Forest Hills, Queens, NY. Your evaluation of her health and your approval of enabling Mrs. Kara to come to McPeak's was of such help to me and the short distance, God sent. I have to also thank Jennifer Turner for working out all other matters with the previous social worker. Jennifer is a beautiful, poised and gracious lady. She truly has some of the best management expertise and talents, not to mention her mannerisms. She is very fine. I would also like you to know that Soroya has answered to my needs with true professionalism – another fine character. It is also at this time that I would like to thank Ms. Myrna Aviles for calling me several times – especially one hot summer day when my aunt was diagnosed with pneumonia. Mr. McPeak, these are the special things that make a patient's family feel comfort. Everyone there: the girls, the aides and all those who are in contact with her made your home her home as well. Thank you so much and Happy Holidays." "Tess and my family would like to thank the entire staff at McPeak's for all they do to make Tess as comfortable as possible. Hope is a gift all people can share. We all wish you a very Merry Christmas." "To the wonderful staff at McPeak's, Yet another year has come and gone and the care and compassion has been the same. You guys are amazing at what you do and we are so thankful for all you do for our mother. It is a great peace of mind to know you are there. May you all have a joyous and healthy season." "Merry Christmas with all my thanks for your extraordinary care of Don during his time at your residence. You are all special people. Happy New Year to all." "Jim, I want to personally thank you for your donation to our Church by giving to our golf outing. Your help allows us to continue to minister to our community and the world with faith and compassion. Your support now and in the past has been a blessing to me and is greatly appreciated." "Dear Mr. McPeak and the entire staff: Just want to say thank you for running such a sensitive and professional establishment. My mom's 93rd birthday was today and Merna and her "girls" were wonderful. They made us feel so welcome, helped us get Mom outside for a family lunch and then back inside for a birthday song and cake. We all went home so happy that our great-grandma, grandma and mom is being so well taken care of! Thanks again." "Thank you all from the bottom of our hearts for the compassionate and fine care you gave to our loved and greatly missed husband and father. God bless all of you special people." "Hey Jennifer - I would like to thank you and your staff for allowing Alex to feel comfortable in his new home. Alex tells me his meals are good-plentiful and most importantly HOT! It takes a lot of stress off me with Alex happy. Your staff has him drawing daily. He is loving it! GREAT JOB!" "Tess Donovan died January 26th at the Brookhaven Care Facility. While she lived at your home, she enjoyed some of the best years of her life. As you know, she loved the table bowling and bingo games and many of the activities that you provide for your guests. I want to thank you and your wonderful staff for all you did to make my Mother as comfortable as possible while living with you. I would be happy to refer your facility to anyone, anytime." "Thank you for the excellent care you gave to my mother Mildred during her stay at McPeak's. Your staff was always so pleasant and accommodating. We were always comforted by the fact that mom was safe and well cared for." "Thank you for the care and attention your staff gave to my father over the years. We were very satisfied with the services and activities you provided during his stay at McPeak's. I don't know how you did it but, Dad was very happy at your home. You made a difference for us too." "I'm glad I'm not in all that snow right now. It's very cool here (by Fla. standards - in the 40's). Thank you for your attention to this matter and for all the kindness you showed my sister Doris, while she was at your facility."